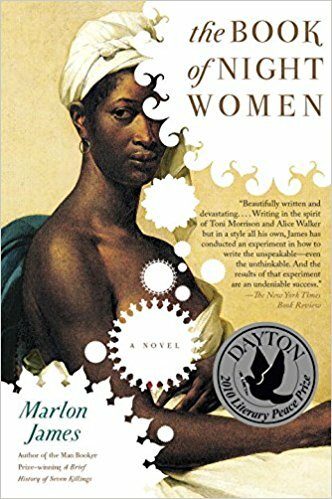 The first book I read this year was The Book of Night Women by Marlon James. Fun fact: Marlon James teaches at my alma mater, and I used to see him around campus and at black functions. I would marvel at his effortless style swag, but never mustered the courage to actually speak to him. I have had all James' published books on my to-read list, but had not actually gotten around to reading one yet. So I decided to pick up a copy of The Book of Night Women from the library, and I am really happy that I did. The book follows Lillith, an enslaved woman born at the turn of the 18th century on Jamaican plantation. Her mother dies in childbirth and the white overseer who raped her mother places her in the care of another slave woman. The book follows Lillith as she grows into adolescence and then into the womanhood, and the complications she and the people around encounter within the brutal institution of slavery. The book is beautifully written, incredibly well-researched, and painfully violent. Despite being quite squeamish, I struggled to put the book down and swallowed it one or two sittings. It is one of the most creative and compelling fictional documents on slavery. Highly recommended!